Beyond the Scoresheet » JY20: Let the tournaments begin! To understand the tournament landscape, it helps to know the old rules. When I was in high school, and up until the late 2000s, NJSIAA teams were allowed to play 20 regular-season games, plus one tournament, plus one league playoff series. So how many total games you could play depended on the number of games in your tournament. This was pretty cut and dry. There were a couple of instances of teams entering multiple tournaments, but they kept their total number of games down to 20 to make sure they complied with state rules. Nowadays, teams are limited to 26 games, including any playoff or tournament games. So it opens things up a little bit more in terms of tournament participation, as long as you plan in advance. Tournaments come in all shapes and sizes, with varying rules for determining winners, losers, point totals, and placement. They range from your standard two-day, four-team event (i.e. the Bayonne Tournament, an old favorite of mine, with semifinal losers and winners playing for third and first places, respectively, on the second day) to the broad, 30-plus-game extravaganzas hosted by the Ice Vault and Codey Arena this year. Those come with pre-set schedules and point values for each period, providing some outstanding matchups but taking away some of the edge of the knockout tournaments. There are out-of-state tournaments too (although they can be difficult to find for New Jersey teams, which are not allowed to play multiple games in one day or play on three consecutive days), most notably the Mount St. Charles Holiday Face-Off, an eight-team event hosted by the Rhode Island power that traditionally has included one top team from each of several surrounding states. Unfortunately, the Cron Tournament (I pronounced it ‘CRAHN’ for years, but it’s actually ‘CRONE’) has not been played since December 2011. (Summit, pictured above, won the last title, for now.) But there are still some great tournaments to see. The Ice Vault certainly has the best competition (Bergen Catholic, Lakeland, Morristown, Morris Knolls, Ramsey, St. Joseph Metuchen, Summit in the top division) and tends to pit some of Morris County’s best against the top Bergen County schools. Things really get going throughout the state Dec. 26-30. Montclair is another school that has a long tradition of hosting a holiday tournament, and this year’s field of eight public schools (including Montclair, Ridgewood, Montgomery, and Mendham) could produce some excellent matchups. The renovated rinks at Winding River in Toms River usually throw up some entertaining matchups, and for pure volume of games, Codey/South Mountain (featuring Livingston, Madison, St. Joseph Montvale, Seton Hall Prep, among others) will be hard to beat. Nobody from New Jersey is going to the Mt. 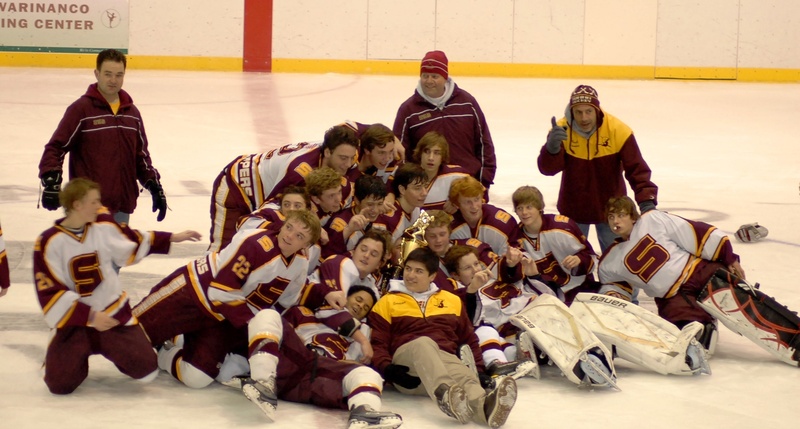 St. Charles Tournament this year – it consists of three games in three days, and the NJSIAA has never granted an exception to that rule – but St. Peter’s Prep (to Connecticut) and Delbarton (to Massachusetts) will venture out of state for tournaments later in the year. Personally, I love the knockout tournaments, with the potential for overtime (the only time we get to see it in the regular season!) and the chance to celebrate with a trophy. Of course, that kind of prize doesn’t mean as much as a county, league, or state tournament title, but it still adds a little cheer to the holiday season!